The Stated Truth » The Best Guess….. The InTrade markets trading on the various outcomes of the Presidential have become increasingly liquid and active in recent weeks. 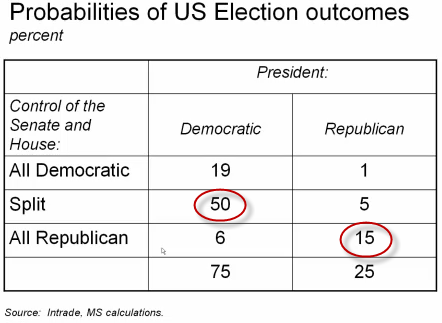 As Morgan Stanley’s Vince Reinhart cleverly notes, by analyzing the odds for control of the Senate, the House, and the Presidential winner, one can arrive at some rather useful insights into the conditional probabilities of various tax-and-spending-related outcomes. Critically, he notes that while Obama is a 75%-25% favorite to win the vote, control of the House and Senate appears most likely to remain split. There is a joint 50% probability of an Obama victory and split government – which inevitably means more gridlock and a likely charge over the fiscal cliff. On the other hand, conditioned on a Romney win, there is a 15% probability that the Republicans end up with control of the House and the Senate– which almost inevitably means the ‘new’ government will enact the front-laoded spending cuts they have been putting forward. This leaves us with at least the combined 65% probability of drastic cuts to spending or rises in taxes which will weigh heavily on the aggregate economy early in 2013. Intrade is an online trading exchange website. The website’s members bet on the outcomes of non-sports-related future events. Intrade was founded by John Delaney in 1999. Intrade.com offers only non-sports markets (politics, finance, entertainment, current events, transportation, legal, weather, pop culture, etc. ).